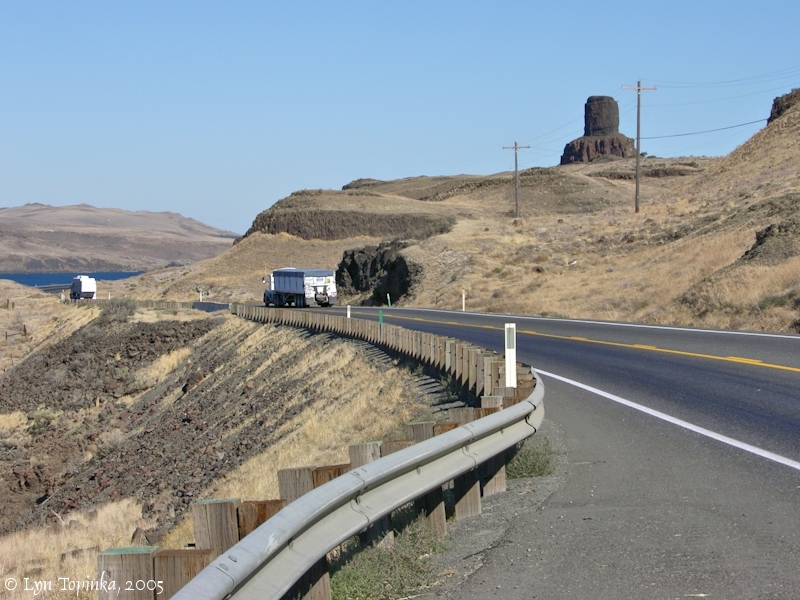 The "Twin Sisters" is a distinctive basalt feature within the Wallula Gap at Columbia River Mile (RM) 313.5, just upstream of Port Kelley, Washington. The Twin Sisters are located on Washington State Route 730, two miles south of U.S. 12 between Pasco, Washington, and Umatilla, Oregon. The U.S.National Elevation Dataset (2018) lists the Twin Sister's elevation at 449 feet. While Lewis and Clark made mention of the Wallula Gap, they did not make separate note of this distinctive rock formation. 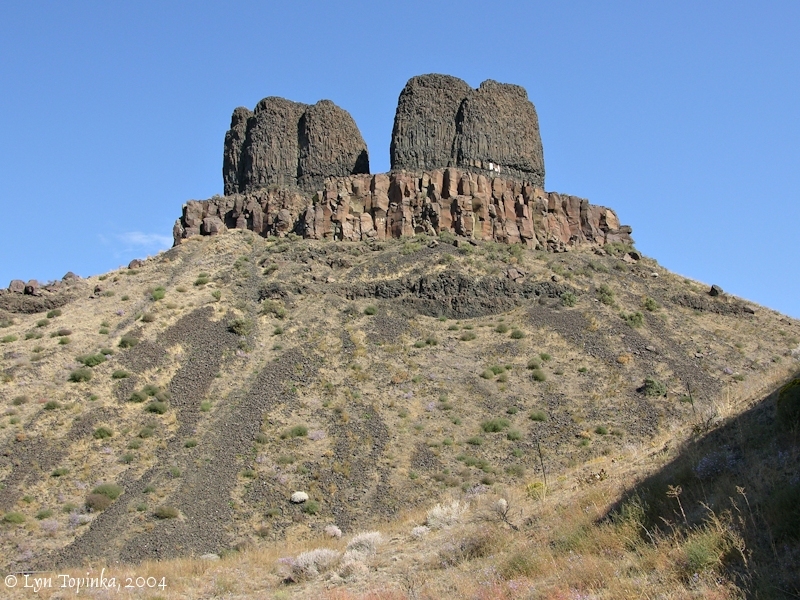 The Twin Sisters are a part of the massive outpouring of Columbia River basalt lavas which were eroded by the Missoula floods. "Coyote, the mischievous spirit hero of many native stories, fell in love with three sisters who were building a salmon trap on the river near here. Each night Coyote would destroy their trap, and each day the girls would rebuild it. One morning coyote saw the girls crying and found out that they were starving because they had not been able to catch any fish in their trap. Coyote promised them a working fish trap if they would become his wives. They agreed, and coyote kept his promise; however, over the years he became jealous of them. 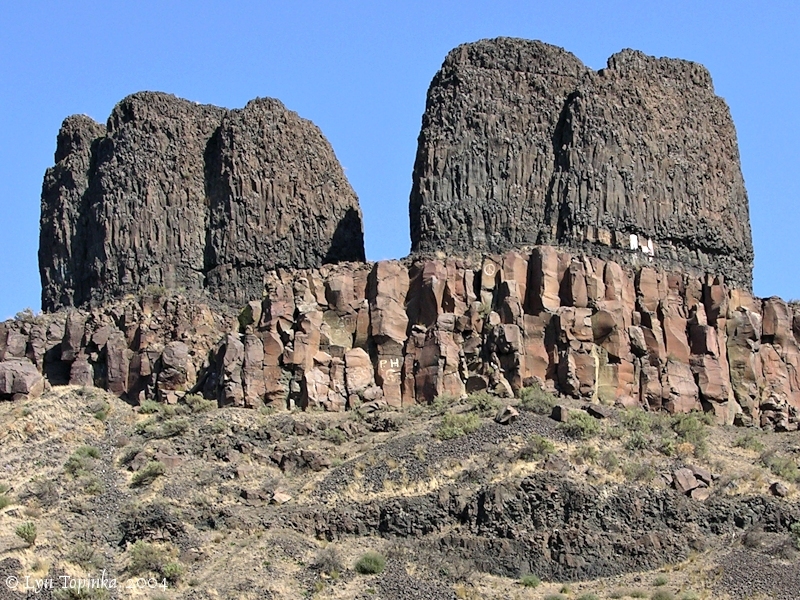 He changed two of the wives into these basalt pillars and turned the third into a cave downstream. He then became a rock nearby so he could watch over them forever." [Washington State Chapter, Lewis and Clark Trail Heritage Foundation, April 2000 Newsletter]. In the writings of Paul Kane, written about his journey in 1847 (see below), the legend is similar, however the "Wolf" is the spirit. "... Now the great medicine wolf of the Columbia River -- according to the Walla-Walla tradition, the most cunning and artful of all manitous -- ..."
This feature throughout history has acquired many names. 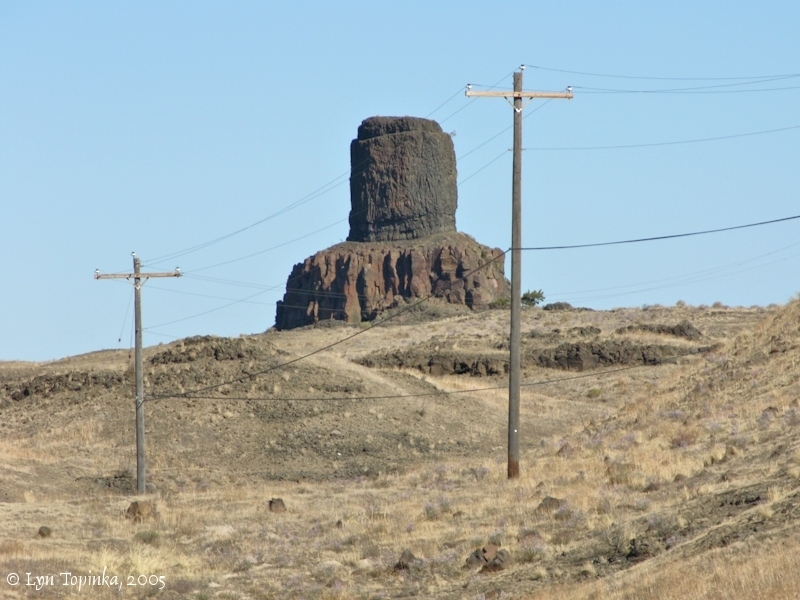 They have been known as the "Two Captains" after Lewis and Clark, "Chimney Rocks" by early explorers, "Twins Sisters" or "Cayuse Sisters" by Indian legend, and even occasionally "Two Sisters", "Hell's Smoke Stacks", and "Twin Pillars". "... These are called by the voyageurs the Chimney Rocks ... The Walla-Walla Indians call these the 'Rocks of the Ki-use girls' ..."
In a 1940s photograph J. Boyd Ellis called them "McKinzie and Ross Rocks" (see The Golden Age of Postcards below), presumably after two early explorers in the Pacific Northwest, Donald McKenzie and Alexander Ross. In 1979 the U.S. Board of Geographic Names made "Twin Sisters" the official name. 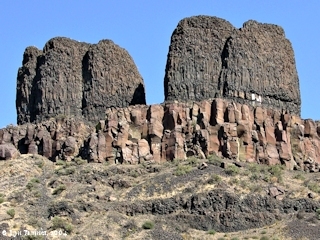 Click image to enlarge One of the Twin Sisters, Wallula Gap. View from the west from turnoff on Highway 730. 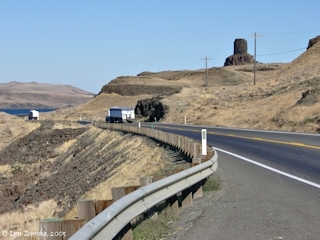 The Columbia River is visible on the left. Image taken September 25, 2005. Click image to enlarge One of the Twin Sisters, Wallula Gap. View from the west from turnoff on Highway 730. Image taken September 25, 2005. 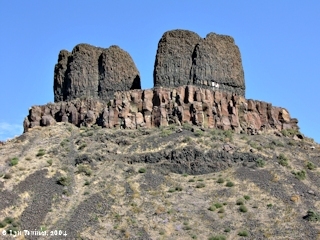 Click image to enlarge One of the Twin Sisters, Wallula Gap. View from the east from turnoff on Highway 730. Image taken September 25, 2005. "[Tuesday, October 10, 1811] ... Our camp is quite a picturesque place. Immediately under the high bluff of the far-famed Columbia, about one-half mile above are two rocks rising 100 feet above the level of the river. They are separated by a small space, and are nearly round, presenting the appearance of two towers. Mr. McKinley informed me that the Indians looked upon them with a great deal of veneration, and say that they are two Indian damsels, petrified. I must confess that their appearance does not correspond very well with the tradition." Source: James W. Nesmith, 1843, "Diary of the Emigration of 1843", IN: The Quarterly of the Oregon Historical Society, vol.VII, no.4, December 1906. On arriving within a few miles of the Walla-Walla, he saw three beautiful Ki-use girls, whith whom he fell desperately in love: they were engaged in carrying stones into the river, in order to make an artificial cascade or rapid, to catch the salmon in leaping over it. The wolf secretly watched their operations through the day, and repaired at night to the dam and entirely destroyed their work: this he repeated for three successive evenings. On the fourth morning, he saw the girls sitting weeping on the bank, and accosted them, inquiring what was the matter: they told him they were starving, as they could get no fish for want of a dam. He then propsed to erect a dam for them, if they would consent to become his wives, to which they consented sooner than perish from the want of food. A long point of stones running nearly across the river is to this day attributed to the magic of the wolf-lover. For a long time he lived happily with the three sisters (a custom very frequent amongst Indians, who marry as many sisters in a family as they can, and assign as a reason that sisters will naturally agree together better than strangers); but at length the wolf became jealous of his wives, and, by his supernatural power, changed two of them into basalt pillars, on the south side of the river, and then changed himself into a lark rock, somewhat similar to them, on the north side, so that he might watch them for ever afterwards. I asked the narrator what had become of the third sister. Says he, "Did you not observe a cavern as you came up?" I said that I had. "That, " he replied, "is all that remains of her!". ..."
Source: Paul Kane, July 11, 1847, Wanderings of an Artist Among the Indians of North America, published in 1859. Click image to enlarge Penny Postcard: Twin Sisters ("Hell's Smoke Stacks"), Wallula Gap, Washington, ca.1920. Penny Postcard, ca.1920, "Hell's Smoke Stacks. 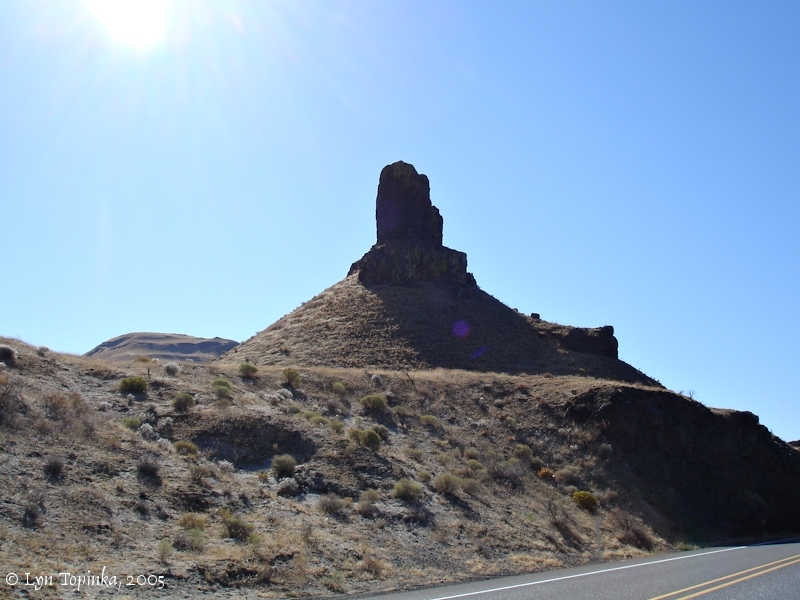 One of the Wonders of Oregon's Scenery." Image Copyright Weister Co., Card #392. Published by Lipschuetz & Katz, Portland, Oregon. Today this basalt outcropping is called the "Twin Sisters", part of the Wallula Gap. 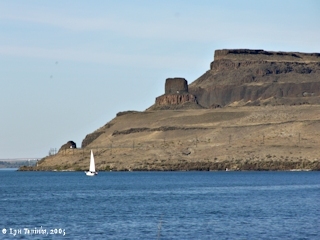 It is located in the state of Washington, on the south side of the Columbia River. In the private collection of Lyn Topinka. Click image to enlarge Penny Postcard: Twin Sisters ("McKinzie and Ross Rocks"), Wallula Gap, Washington, ca.1940s. Penny Postcard, ca.1940s, "McKinzie and Ross Rocks, Wallula Cut Off". Ellis Photo, Card #2861. In the private collection of Lyn Topinka.